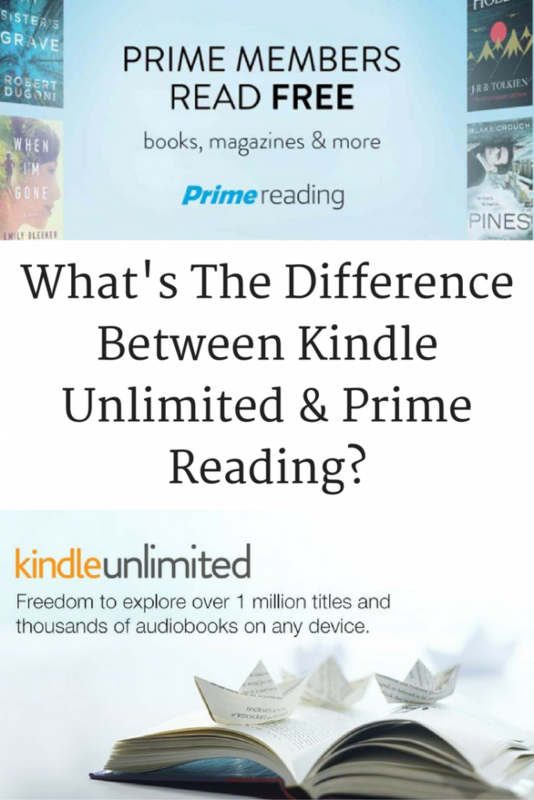 What’s The Difference Between Kindle Unlimited and Prime Reading? In October 2016 Amazon started a new service called Prime Reading. It’s exciting to have even more free books to read! But they also have a service called Kindle Unlimited which I had considered getting since I read so quickly. I wanted to compare the two and see which one was going to be the best fit for me! Prime Reading is available for Amazon Prime members (Amazon Prime and Amazon Prime Student in free trial or paid memberships and customers receiving a free month of Prime benefits with a Fire tablet) and offers unlimited reading from a subset of the Kindle Unlimited catalog, including books, magazines, comics, audiobooks, and Kindle Singles. Kindle Unlimited is a new service that allows you to read as much as you want, choosing from over 1 million titles and thousands of audiobooks. Freely explore new authors, books, and genres from mysteries and romance to sci-fi and more. You can read on any device. Amazon Prime is $119 per year. This automatically gives you access to Prime Reading. So let’s say Prime Reading is included in the $9.92 per month people pay for Amazon Prime. Kindle Unlimited is $9.99 per month. You do not have to have Amazon Prime to get Kindle Unlimited. No you do not need a Kindle for either of these. You can read books on your Kindle device or your phone, tablet or computer with their free Kindle Reading apps. Each programs allows you to check out up to 10 books at a time. How Many Books Can I Borrow Each Month? It is unlimited for both programs. How Many Books Are Included? Here is where the big difference comes in. Prime Reading has about 1,000 titles included. There are some popular ones included and they will rotate them in and out. Kindle Unlimited has over one million books included. And many have an audio component as well that is included. Prime also comes with a component of Audible as well. I haven’t used it yet since only joined today, but it is a plus for me. I was a Kindle Unlimited member for about 2 years and at first I read at least 6-10 books a month and most of them were narrated. Now I don’t read as much, so Prime Reading plus Kindle First will fill the bill for me now. I think there a few elements about prime that should be mentioned-with Prime you can choose from free books each month to KEEP & own, in addition to borrowing others. And, you can share the books you own with others. And, when you create your family list, everyone on that list will be able to read the books that any of you have purchased.